People always seem confused when I simultaneously argue that (1) we spend too much on health care and (2) we have sub-optimal quality. How can that be? The assumption is that there must be a lot of waste; the assumption is that this waste can be easily ferreted out and cut. The harder thing to accept is that because of our sub-optimal quality, we actually need to spend more on parts of health care. Yes, more. PURPOSE The US Preventives Services Task Force (USPSTF) is authorized by the US government to review and disseminate the scientific evidence for clinical preventive services. The purpose of this study was to evaluate the alignment of Medicare preventive services coverage with the recommendations of the USPSTF before implementation of health reform. METHODS We recorded all Medicare coverage for preventive services as listed in the Medicare preventive services guide of 2007 (including the 2009 update) for all recommended (A-or B-rated) USPSTF and not recommended (D-rated) guidelines for preventive screening and counseling in adults aged 65 years and older. We analyzed 2 components of preventive care: preventive coordination (risk assessment, patient motivation, and arranging of preventive service) and the preventive service itself. The main outcome measure was the percentage of agreement between USPSTF recommendations and Medicare coverage. 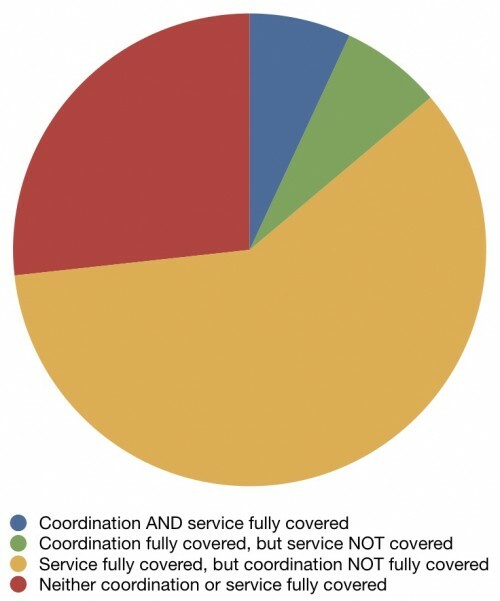 For only 7% of recommendations were both the coordination and service fully covered. For about a quarter of services, neither the coordination nor service were fully covered. For all there rest, coverage was full for one aspect and partial at best for the other. I’m not saying that insurance should pay for everything, but if we do studies that prove that services have a benefit, then it’s reasonable that those are the things Medicare should cover. Those are the things that will improve our quality. Yes, it will increase the costs of Medicare, but we should pay for these. So we’re confronted with a set of screening recommendations with excellent evidence that aren’t paid for, and a list of screening tests that are recommended against that are paid for. That’s how you wind up with a system that (1) costs too much and (2) has sub-optimal quality. You pay for stuff that doesn’t clearly work and don’t pay for stuff that does. The problem, however, is that for many Americans, and the politicians who represent them, this doesn’t qualify as waste; it can’t be cut. If we suggest it should be, there are cries of rationing and death panels. But make no mistake about it, this kind of waste is a huge drain on our resources, and until we’re willing to confront it, we will never be able to control health care costs. Not to get too much into the economic theory weeds, but I think it’s worth mentioning that value-based insurance coverage decisions should not just be a function of whether a service is valuable or not. It is also a function of whether patients would under/overconsume the service depending on the level of cost sharing. This is the topic of Pauly and Blavin (2008) in the Journal of Health Economics. That said, it is certainly a good rule that useless things should not be covered! How/whether to cover useful things is more complicated. For reference, how much would it save on net if Medicare stopped paying for all D-rated treatments AND payed completely for all A and B rated ones? Are we talking about something that would make a significant start on “bending the curve”?